Relate: Moses was a murderer. Long before coming down that mountain with those stone tablets in his arms, he had killed a man. Out of fear that he might be found out, he ended up living as a fugitive in the desert for four decades. I wonder as he heard God give him those Ten Commandments how vivid the memory of his past moral failure was. Did the memory of that fateful decision come back to him when he heard God say, “Thou Shall Not Kill”? What went through his mind?Was he thinking about how unworthy he was to bring these commandments down to the people? React: I am a murderer too. Not in a legal sense, no. I do not have to worry about any statute of limitations and have no need to try and bury any evidence to prevent experiencing an extended stay at my local penitentiary. Actually, I have much bigger things to worry about. If my punishment could be satisfied with something as easy as a twenty year prison sentence, I would be very lucky. The punishment waiting for my murder is hell. You see, I have been angry at someone without good reason. Therefore, I am a murderer. So are you. I am also an adulterer. I have looked at a woman with lust. I am a liar. I am a thief. My mom would quickly and wholeheartedly agree that I have dishonored my parents. After all, I did spend quite a few years as a teenager and they were a bit rockier than average. I have coveted. I have built idols in my heart. So have you. Pick a commandment. I have broken it. We all have. If you are thinking to yourself, “Well, I haven’t” then you are guilty of lying even as you read this. Each and every one of us have broken each and every commandment over and over again. 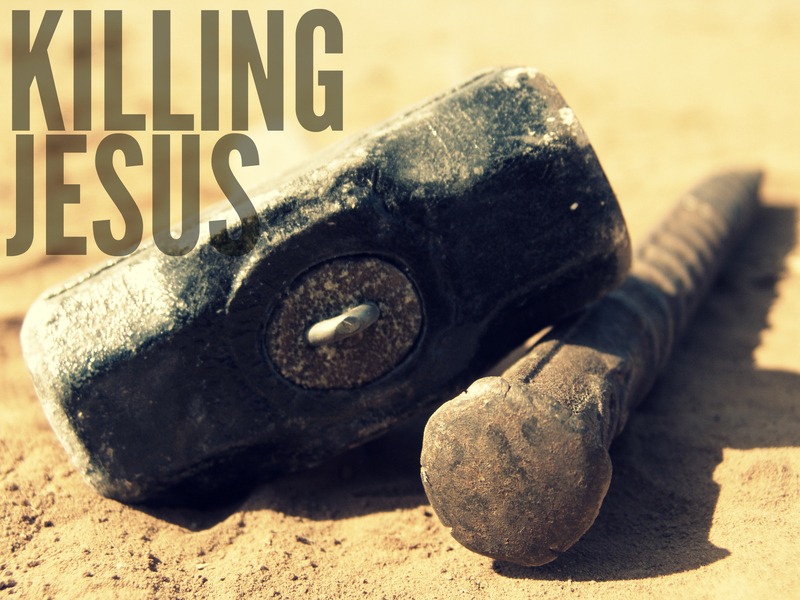 Every time we willfully do so, we are guilty of trying to kill Jesus. It might be easy to think, “That is crazy talk. Just because I have told a little white lie does not mean I want to kill Jesus.” That is what the Jews were thinking when they replied to Him, “You’re demon possessed. Who’s trying to kill you!” The only reason we don’t recognize what we are doing is because we have no idea how deep and how profound and how deadly our sin is. Every time we break God’s law, we are guilty of killing Jesus. We are the murderers of God. Forgive me for not taking my sin seriously. Forgive me for making light of Your grace and Your mercy. Help me to never take for granted the truth and the profundity of heaven and hell, sin and grace, our rebellion and Your death and resurrection. Sometimes they are concepts that I’ve thought I thought about so much that I take them flippantly. Forgive me. You died that I might not have to. I killed You in my arrogance and ignorance and sin. Forgive me. Lead me not into temptation and deliver me from evil. For yours is the kingdom and the power and the glory forever. Let us seriously heed the Lord’s admonition, and do not recurringly kill our Lord by our carelessness. Ugh, I’m here with you! Oh Lord, have mercy on me for I am a sinner. But I know I am covered in Your blood and You don’t see my sin. But I do and so does my family. Help me live righteously! Great post, thank you so much for it. Guilty. Lord have mercy on us all. If something is really broad and covers lots of things easily, then it’s a really bad thing. Brilliant! Exactly on target. My sin makes me one of Jesus’ killers. Thank You, Lord Jesus, for Your gift of forgiveness. Praise the Lord for His provision. He loved us enough to die for the very ones who have let Him down. May that sacrifice not be in vain! May our guilt, our shame, our insufficiencies bring us humbly to our knees at His feet. Let us seek Him and the pardon only He can provide us! Let us seek it as our lives depend upon it; because they do! Wow. A few years ago I had a partial revelation of this. And as I grow the Father shows me more… We have to live with an awareness that our sin hurts God. I am reminded of the old song “Were you there when the crucified my Lord?”. Yes, yes I was because my sin put him there. Wow. Jesus thank you for your blood. Let us not take this lightly. Lead us into righteousness Father. Thanks for the provocation BJ. Done in a very relevant way, good stuff. So accurate you are in stating that so many don’t understand the damaging effect their sins have on their relationship with Christ. Upon the cross at Calvary He took upon himself not only the sins of that time, but the sins from all eternity; past, present and future. He is the sacrifice for which our sins are atoned. In that He experienced our human weakness and suffered the effects of our sins before we performed them. Our reality is that Christ’s forgiveness is freeing. It cleanses and gives us an opportunity to make things right. And gives it not as a get out of jail free card, because He commands us to go and sin no more. How great is His Divine Mercy, that He tells us to forgive not seven times, but seventy times seven times. In saying that, He understands what we are up against in this world and offers us His constant forgiveness, so long as we act on the following: that the mercy we receive from Him must be measured out by us to others. Blessed are those who experience anguish in their sins, for they recognize the harm that it does not only in trading heaven for hell, but above all, because we offend Our Lord, who loves us beyond compare. I always preached the Matt 5.28 also. Thought crimes were the same as acted on crimes. I realized this is rubbish to keep us guilty for the crime of having a conscience capable of being manipulated by those who would like to control my life. Our current criminal justice system does not charge or convict people of just the intent or thought but the opportunity and the action. Can God be ‘less’ just than our societal justice system? I certainly hope not. No one would escape the fires of hell if this monstrosity of biblical morality were true. Happily, there is no evidence whatever that it is.